This is the 5th post in a series about PHP 7.1. I will publish other posts about PHP 7.1 next week but, to conclude this one, here’s a quick flashback listing some nice features PHP 7.0 brought us last year. PHP 7.0 introduced two new operators, once again to simplify and shorten some syntax. This gives the same result as the previous one and will not cause a notice if the variable used as first operand is not defined. The only difference, often an interesting one, is this operand is now evaluated only once. It returns -1 if its left operand is smaller than the right one, 1 if it’s bigger and 0 if they are equal. Because of this, it is quite useful when we are writing a callback function for sorts, for example with the usort() function. 🐈 🐱 😸 😹 😺 😻 😼 😽 😾 😿 🙀 - so cute!!! This is probably the new feature of PHP 7: we can now specify type-declarations (they were previously called ‘type-hints’) with scalar types, and not only with objects / arrays / callables. The different scalar types of PHP can be used for parameters: int, float, string and bool. called in .../test-01.php on line 12"
For parameters, it’s up to the caller’s choice: she is the one knowing if she’s working with weak or strict types. For the return value, it’s the callee’s choice: she knowns if the function she wrote uses weak or strict types. In any case, inside the function, data are of the specified types: the weak or strict mode only determines whether conversions are allowed. PHP 7.0 comes with two evolutions around error handling. string(43) "Call to a member function methode() on null"
Let me insist: this change, which will help those running PHP programs for a long time (think: daemons), is for now only applied to some fatal errors — and only when they are raised from PHP’s engine. Along with this change, the hierarchy of exceptions classes has been re-thought, introducing a new Throwable interface, shared by all exceptions types. This way, the code catching Exception does not magically also start catching Errors with PHP 7.0. This ensures the behavior of your code will not change when upgrading from PHP 5 to PHP 7. We’ll get the following output. We can especially notice the "Monde" we gave as a parameter to the constructor, and the fact state has been shared between both methods, using the $qui attribute. A typical use case would be a callback dealing with two options, like a success() and a failure() method, only using one object implementing the corresponding interface — and not using two separate functions anymore. Generators are still a young feature of PHP, as they’ve been added with PHP 5.5 and the community and developers only begin thinking about more advanced way to use them. ‣ If you’d like to know more about generators, here’s a series of posts on the matter, written by several members of the community a few months ago: Generators’ week: here we go! PHP 7.0 brought two new features to generators. How can this help? We can for example think of a function that would generate intermediary values, finally returning some kind of total calculated from these. This is especially interesting when we need to aggregate data coming from several sources — for instance, to load data from a database (using a first generator) and a CSV file (using another generator). And see you next week for more posts about PHP 7.1! 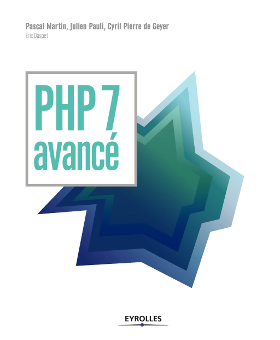 I am a co-author of the book « PHP 7 avancé ». You can follow me on @pascal_martin and sometimes see me on StackOverflow.